Bird watching, or “birding” as many people who watch birds have come to call it these days, is perhaps the most popular form of wildlife observation in the world. Birds, by their very nature, tend to be more visible, noticeable and accessible than most other forms of wildlife. It’s birds, more often than not, that first attract the attention of budding wildlife enthusiasts when they’re very young… birds that ultimately kindle that insatiable curiosity with nature that grows to become a lifelong passion. While Ireland is perhaps not the first place people think of when it comes to international birding hot-spots, Ireland has a lot to offer both visiting and resident bird watchers of all levels of skill and experience. Bad weather, fewer bird species, geographical isolation… is Ireland really any good for bird watching? The short answer…? Yes, absolutely! Ireland is perhaps not the first place you think of when you consider great birding destinations around the world. There’s no getting around the fact that weather can be marginal, light is often challenging, the resident and breeding species lists are comparatively short, and our position on the periphery of north western Europe means we’re not in the ideal location for most European and Asian migrants either. 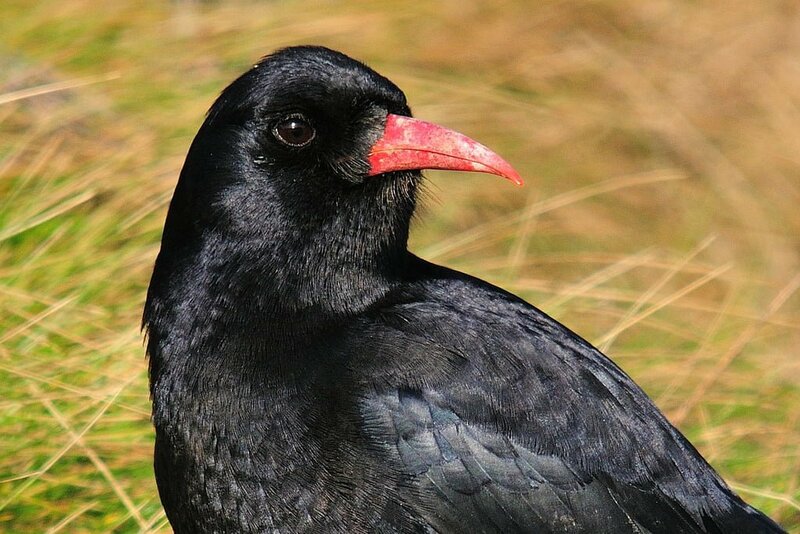 Ireland is a stronghold for the chough, which is quite common around Irish coasts. (Photo by Andrew Malcolm via the Ireland’s Wildlife group on Flickr). But hold on. Ireland has a few redeeming features that make it a fantastic place for both local and visiting birders. Ireland’s coastline and offshore islands host some of the world’s largest and most spectacular breeding seabird colonies. Ireland is home to important breeding populations of some birds that are scarce and declining in other parts of Europe — making it one of the best places to see species like chough and corncrake (although the latter is sadly in serious decline here too). The Irish scenery — particularly around the coast — is simply breathtaking. TOP TIP: You can read more birding related content on Ireland’s Wildlife by following this link. 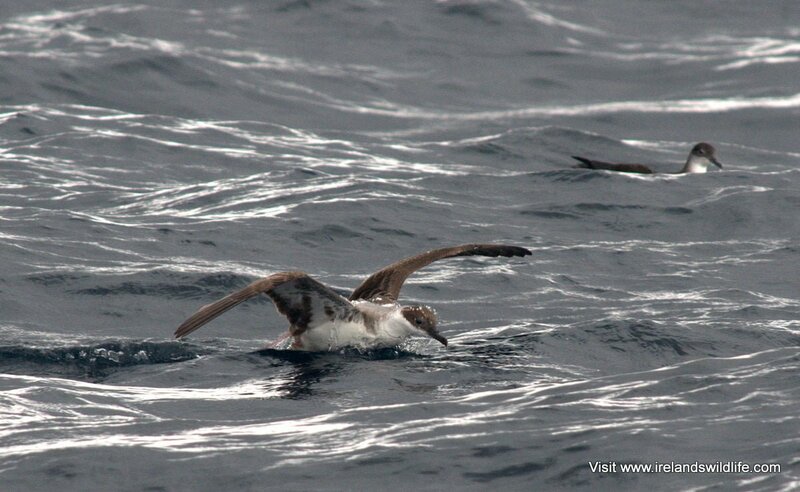 Seabirds like this great shearwater are regular visitors around Ireland’s coasts. Ireland is an island nation, so it’s no surprise that seabirds feature prominently as part of her avifauna. From fabulous seawatching, opportunities to some of the world’s largest nesting seabird colonies, Ireland’s seabirds offer some truly outstanding birding opportunities — all set against the backdrop of our world renowned coastal scenery. Seawatching is doing exactly that — watching the sea. Or, more accurately, scanning the sea for passing seabirds just offshore. Ireland’s coastal headlands and islands are recognised as some of the best seawatching locations in Europe. While you can see seabirds at any time of the year, huge numbers of seabirds pass along the Irish coast annually from mid- to late-summer into early Autumn. The best months for seawatching are from July to October, with the peak number of birds and variety of species typically from August to September. You’ll find some of Europe’s best seawatching locations on the Atlantic coasts in the north-west, west and south of the country. Some of the most well known seawatching spots in Ireland include The Bridges of Ross in Co. Clare, Cape Clear Island in Co. Cork and Kilcummin Head in Co. Mayo, but headlands right around the Irish coast can offer great seawatching potential when the winds are favourable at the right time of year. We’ll be putting together a feature focussed on seawatching in Ireland, detailing key Irish sites, in time for the next seawatching season (summer 2014), in the meantime, you’ll find a great guide to Ireland’s best seawatching sites in the back of “Finding Birds in Ireland” by Eric Dempsey which we reviewed here. Spectacular movements of Manx shearwaters are annual, and when conditions are right they can make for a truly awe-inspiring spectacle with an endless stream of thousands of birds an hour passing by. On occasions they can be joined by sizeable numbers of larger shearwaters, with sooty, great and Cory’s shearwaters occuring regularly, sometimes in large numbers. Smaller numbers of Balearic shearwater are also recorded annually, along with infrequent but practically annual views of rare “Fea’s-type” petrels. Of course any seawatching session in favourable conditions will yield a host of other species too from the usual suspects like gannets, fulmars, puffins, razorbills and storm petrels, to less common species like skuas — or jaegers to our American visitors — (great, arctic, pomerine and occasionally long-tailed skuas are all seen off the Irish coast). The best conditions for seawatching aren’t necessarily the “nicest” conditions for sitting out on an exposed headland. A brisk onshore wind is best as it tends to push the birds closer to shore. Sunshine (and the inevitable glare that goes with it) is the seawatcher’s arch enemy — so cloud cover is the order of the day, and even perhaps the occasional blustery shower. It’s not unusual to get wet and cold when you’re seawatching for a lengthy period. It is understandable perhaps that seawatching is considered by some to be a bit of a “hard-core” birding pastime — but if you time it right the experience of watching thousands of seabird pass close to shore is truly memorable. TOP TIP: When seawatching make sure you have fully waterproof optics (binoculars are essential and a good spotting scope is a real boon to get views of distant birds), and don’t forget waterproofing for yourself — pack the all-weather gear to stay dry and comfortable on your chosen headland. You can read our binocular and spotting scope reviews here. A visit to one of Ireland’s breeding seabird colonies — like the Skelligs off Co. Kerry or the Saltees off Co. Wexford — during spring and summer is another of Ireland’s birding highlights. Islands and sea cliffs on Ireland’s West Coast in particular play host to some of the world’s largest breeding seabird colonies. Little Skellig, off the coast of Co. Kerry, supports some 30,000 breeding pairs of northern gannet, with many thousand more non-breeding birds in attendance. Island’s off the west coast also support some of the world’s largest breeding colonies of the European storm petrel. 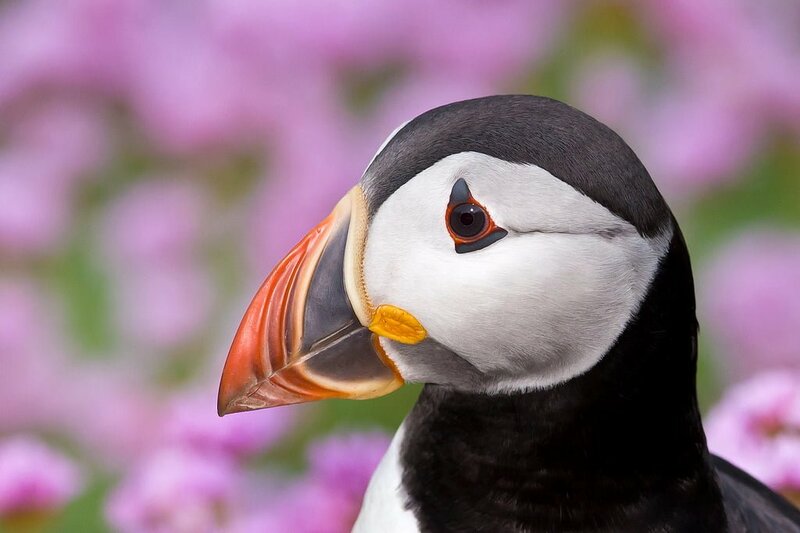 The islands and cliffs right around Ireland’s impressive coastline support a large number of breeding seabirds, including Manx shearwaters, razorbills, guillemots, kittiwakes, fulmars and of course the enigmatic puffins. Ireland is also home to some notable breeding tern colonies — including several common and arctic tern colonies, a sizeable little tern colony at Kilcoole, Co. Wicklow, and an internationally important roseate tern colony at Rockabill, Co. Dublin — Europe’s largest, with up to 1,200 breeding pairs. Rockabill itself is closed to visitors, but a smaller roseate tern colony at Lady’s Island, Co. Wexford (some 100 pairs) offers good opportunities to view this most elegant of terns. TOP TIP: When visiting an Irish breeding seabird colony please put the birds first, and always follow this seabird colony code of conduct put forward by Birdwatch Ireland and the Irish Wildlife Trust. 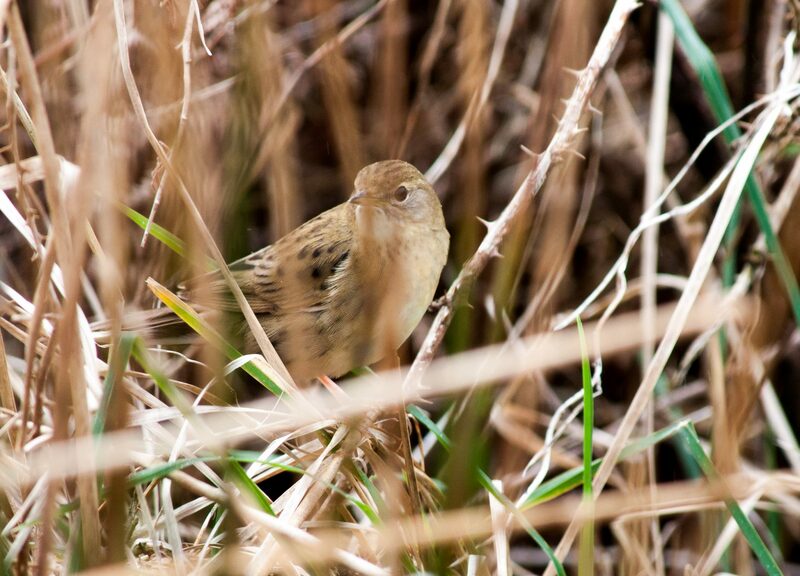 A grasshopper warbler — a summer visitor to Ireland on the move in Spring and Autumn. Spring and Autumn migration are important events on the Irish bird watching calendar. Both signify a change in the range of bird species we see across the country, and, because birds are on the move, increase the likelihood of seeing species in places you wouldn’t normally expect to find them. If you bird watch regularly on a local patch, you get to know the usual suspects well — the year round residents, the summer breeders and the winter visitors are all part of the annual patchwork of species you come to know and love. In spring and autumn though, when birds are moving from their winter feeding grounds to summer breeding grounds and vice-versa those familiar birds are supplemented with other birds that are “just passing through” — and that increases the odds of the occasional unlikely visitor. 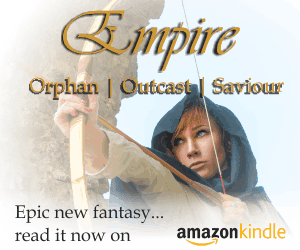 That opportunity to see something a bit different makes spring and autumn an exciting time. You never quite know what you might find when you venture out… and that heightens the sense of anticipation that’s one of birding’s biggest draws. You can read more about Spring Migration in Ireland in this feature article. Autumn migration feature coming soon…. Ireland has a large number of species that pass through the country on migration. Some of these migrants temporarily bolster the numbers of residents, but others, like ruff and osprey, only occur in Ireland as they move from one place to the other on passage. Ireland is a vital “refuelling” stop for many waders, providing them with a place to rest and feed before commencing their onward journey — and giving bird watchers a great seasonal variation in bird species to look out for around our coasts, inland waterways and estuaries. 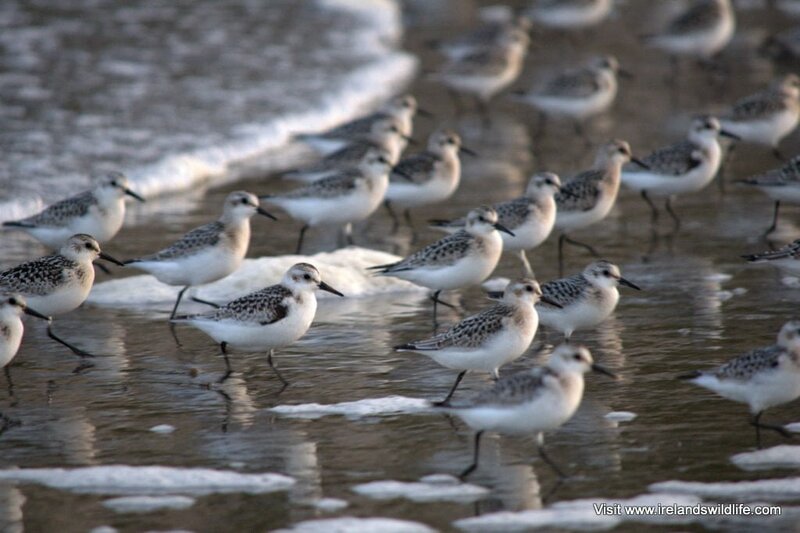 The sanderling is an enigmatic little waders that breed in the high Arctic. It is both a passage migrant and winter visitor to Ireland. Many birds pass through on their way to / from wintering grounds further south, but a small number choose to spend the winter here in Ireland. Ireland is an important place for overwintering birds. Winter in Ireland, while wet and cold, remains mild compared to the rest of northern Europe, and that makes it an attractive wintering ground for many birds that breed further north or east. Irish estuaries and bays never freeze, and even inland bodies of water tend to remain largely free of ice. Waders and wildfowl take advantage of Ireland’s moderate climate and arrive in huge numbers: Canadian brent geese, Greenland white fronted geese, Icelandic Whooper Swans, Golden Plovers and Black-tailed Godwits are joined by Bewicks swan’s from Siberia. Ireland is an internationally important overwintering site for the Greenland white-fronted goose and Bewick’s swan. The “winter thrushes”, fieldfares and redwings, arrive from Scandinavia and Northern Europe every autumn, and occasionally, during irruption years, are joined by flocks of bohemian waxwings… a colourful treat for birders amidst the dreary winter gloom. Finches like the colourful Brambling, and buntings like the lapland bunting and snow bunting can also turn up in small numbers over the winter, so it’s always worth keeping an eye out for the unusual. Migration season brings with it the very real possibility of rare birds turning up well outside their normal geographic range. When birds are on the move, storms and strong winds can, and often do, blow them off course, and they can turn up in the most unexpected places. 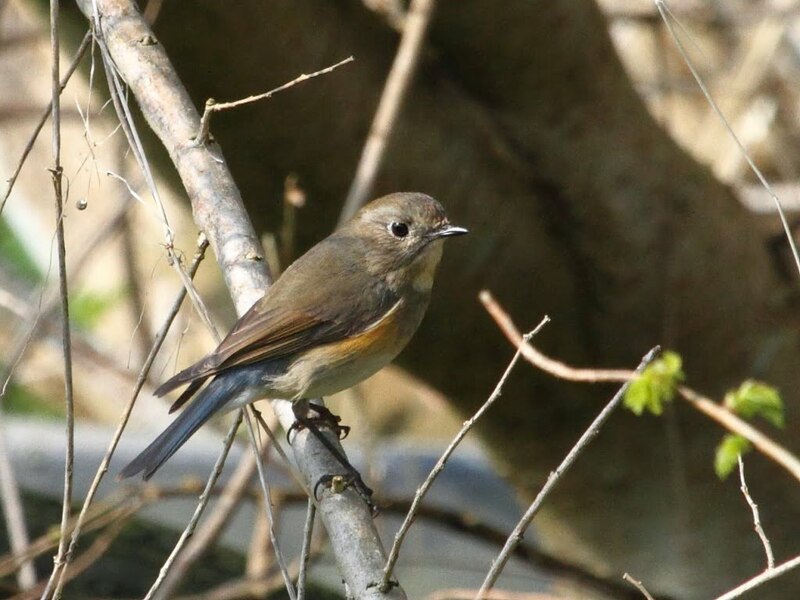 Every spring and autumn these “vagrants” turn up sporadically around Ireland — with those from Europe and Asia (like the red-flanked bluetail that turned up at Galley Head in Co. Cork in spring 2012) typically hitting the south and east coasts of the country first, and transatlantic vagrants, unsurprisingly, arriving along the west, north-west and south coasts. American waders are a regular occurrence, but the occasional American passerine makes the crossing, like the phenomenal Eastern Kingbird that arrived on Inis Mor in the Aran Islands in October 2012 — a first for the Western Palearctic region. TOP TIP: when out birding in Ireland between the start of April and the beginning of May, and again from the beginning of September to the end of October, remember to expect the unexpected… and NEVER venture outside without a pair of binoculars. You never know what might turn up. 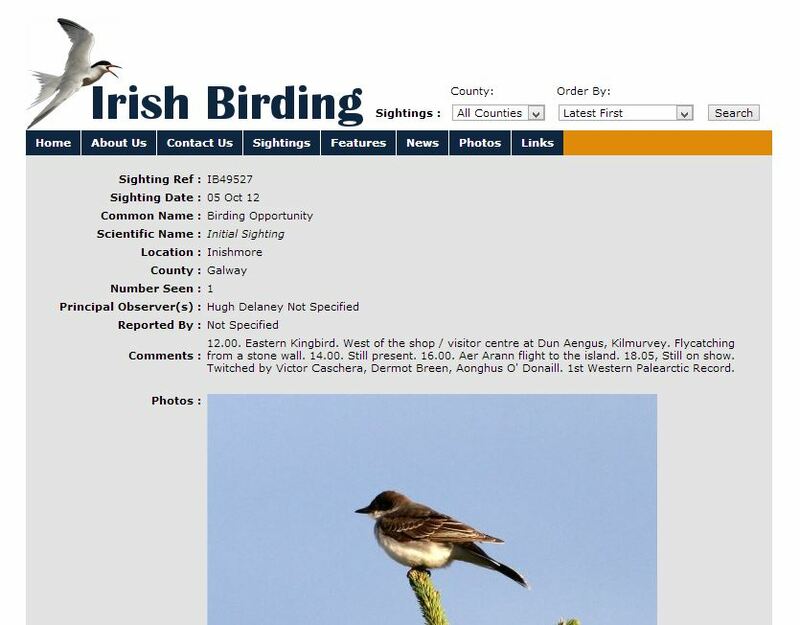 A screenshot of the Irish Birding website showing the record of the Eastern Kingbird that turned up on Inis Mor in the Arran Islands in October 2012. You’ll find a variety of resources online and off-line to help you get the most out of your birding in Ireland. Check out our list of Recommended Birding Resources here. Visiting Ireland? Need a birding guide to show you around? At Ireland’s Wildlife we’re in the process of setting up a network of leading birding guides around the country. Drop us a line using the contact form with details of when and where you’d like to go birding, and we’ll do our best to match you up with a suitably experienced local guide. That’s just a brief taster of what Ireland has to offer as a bird watching destination. Whether you live here and are just getting into bird watching, or you’re an experienced birder planning a trip, Ireland’s unique situation, range of habitats and blend of bird species, coupled with stunning scenery, a hearty welcome and the fact that you can still go birding in relative solitude, all add up to a great birding experience.